Lola, a 1-year-old miniature goldendoodle, currently resides in West Hall on the Mount Vernon Campus with Mark Ralkowski, an associate professor of philosophy. Lola is a self-described feminist with a “bend for philosophy, global health and chicken,” according to her Facebook profile. But she isn’t your average resident on the Mount Vernon Campus. 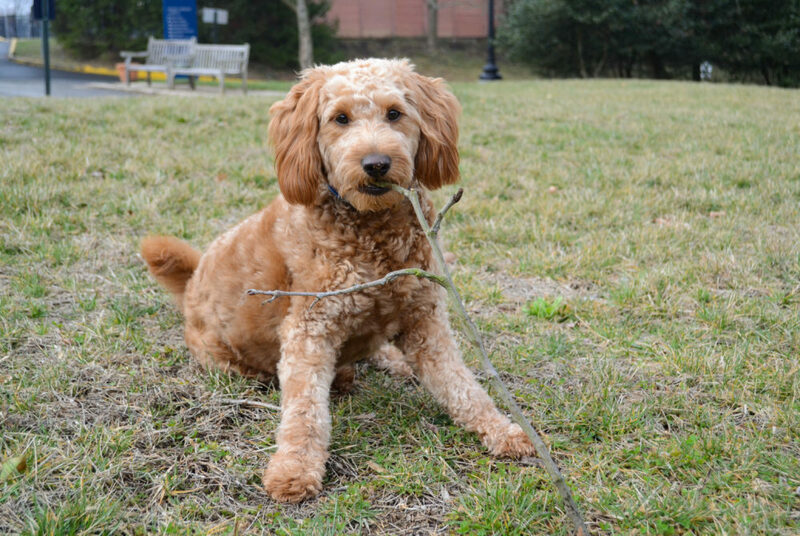 Lola’s a 1-year-old miniature goldendoodle who currently resides in West Hall with Mark Ralkowski, an associate professor of philosophy. This pup outshines the competition for her friendly attitude and popularity on the Vern. Lola ventures off campus for walks, but she is often confused as she anticipates everyone she passes to be a student who wants to stop and pet her, he said. When Lola is not strolling across campus, she can occasionally be found romping around the professor’s honors classes in Ames Hall – a welcome escape from the chaos of college life. Freshman Alex Gunnerson, who is in Ralkowski’s honors Origins & Evolution Modern Thought class, said the dog “de-stresses the environment” as Lola winds through the tangle of students’ legs under the Ames classroom conference table. Several students have the pleasure of dog-sitting Lola and take her on long walks around the Vern, including Kyla Percival, sophomore and West Hall resident. Another honors student, Morgan Patrick, said Lola brings a sense of home to the Vern.